There are at least five ways to look at young Siberian artist Uliana Apatina’s simple yet rich installation of bath, light and salt in this one room gallery. Formally: what merges into red light from without proves to consist of pink, cerise and amber fluorescence, denying any straightforward red. Symbolically: is that salt as in the bible? 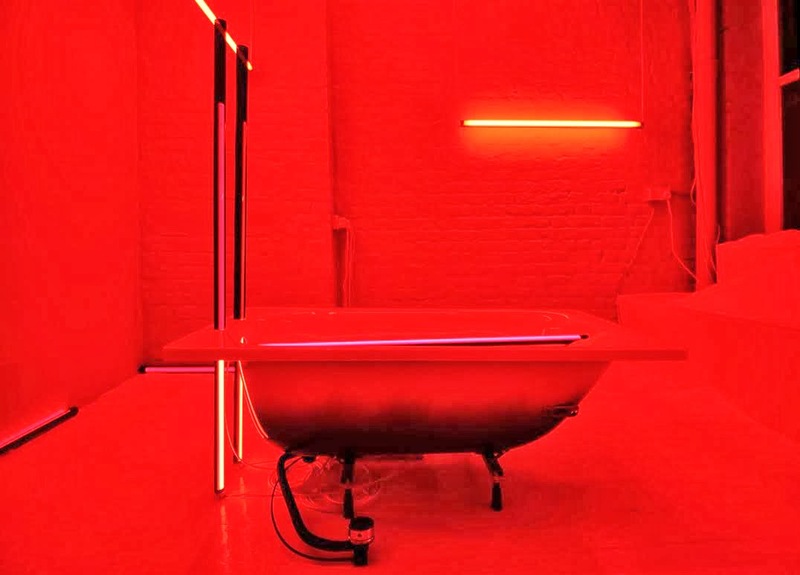 Referentially: Dan Flavin meets Miroslav Balka… Biographically: suppose Apatina dreams of diving into salt, and grew up in a cramped flat with a photographer father who used the bathroom as a ‘darkroom’, the Russian for which literally translates as ‘red room’. Or, of course, personally: what does the strange scene trigger for you? Purdy Hicks make a good job of showing the excellent Helsinki School of photographers, such as Jorma Puranen, Ola Kolehmainen, Susanna Majuri – and Anni Leppälä. She has a persuasive way of presenting linking aesthetics (here, dark reds and clouded reflections), subjects (forests, streams, her copper-haired sister) and approaches (a certain indirectness: faces but glimpsed, one thing seen through another, the past seemingly present) to form a cloud of potential narratives which suggest how fictions emerge from the real. Or as she puts it, ‘to enable the ‘fixed points’ of the visible to be transformed into imaginary space’. 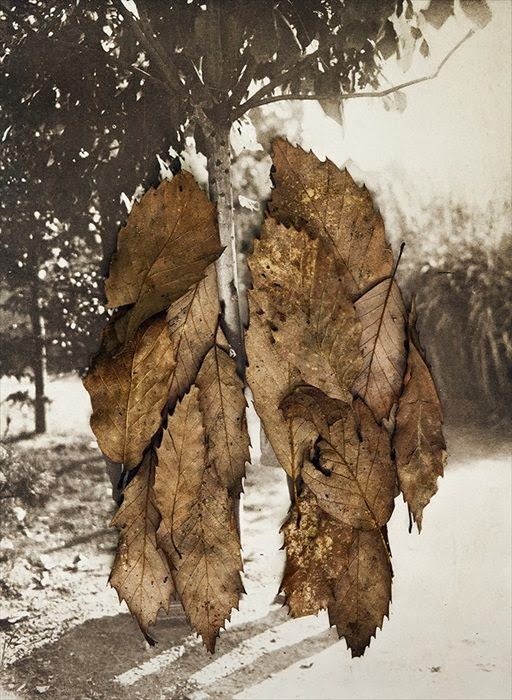 Leaves II (The Couple) might stand for her whole practice, as the fixed points of leaves stuck on a photograph obscure the past space of the figures beneath. 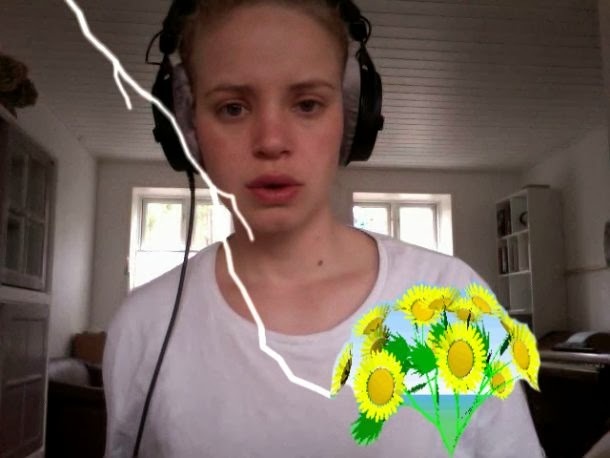 If this show did no more than provide a bigger stage for the stream of work Philomene Pirecki showed at Supplement last year, that would be plenty. 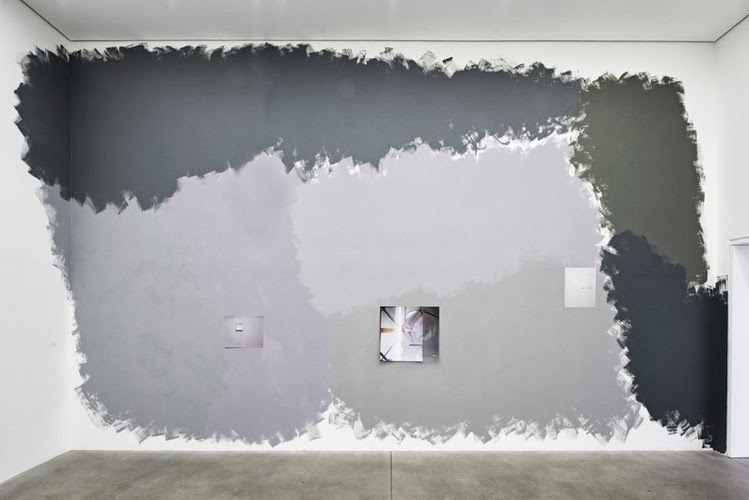 She does indeed reprise one of her paintings which makes a near-abstraction of the word ‘grey’ out of its component colours, and shuffles once more between photographing the space, painting the space, and photographing her painting of the space. Yet Pirecki’s just one of seven artists exploring ‘the self-reflexive business of perception’, and it’s also good to see the results of N. Dash’s cloth-stroking performances, Helen Barff’s felt-wrapped stones Charlotte Posenenske’s modular version of ventilation units, even if I don’t fully understand how they’re ‘inherently self-reflexive’. Deptford’s five Enclave galleries, yards from Deptford station and so six minutes from London Bridge, are well worth a February visit. 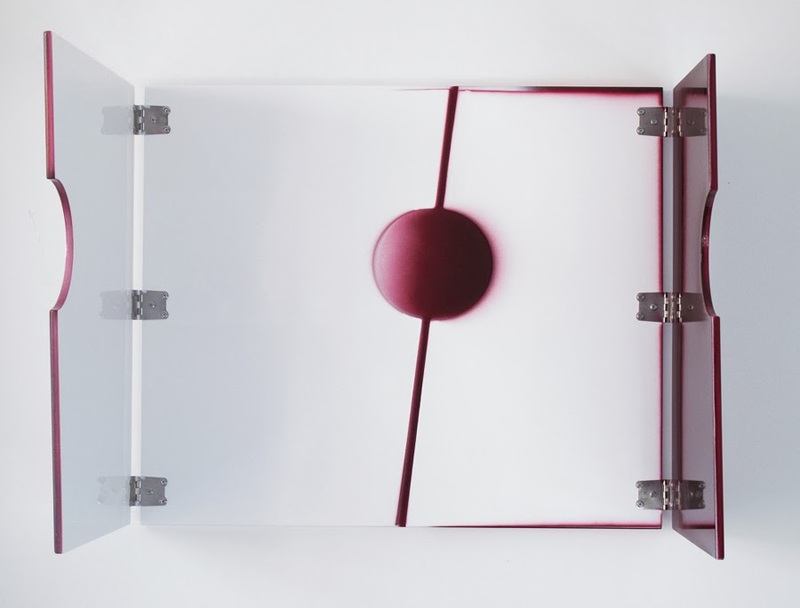 Sculptor Neil Zakiewicz has had furniture manufacturers make painting-cabinet hybrids which neatly demonstrate the logic of their own making: spray-painted through their own holes when folded up, then unfolded and hung so that gravity determines the exhibited look – which is itself provisional, as rotation would change their form as well as their orientation. Painting as a flatpacked game of consequences. 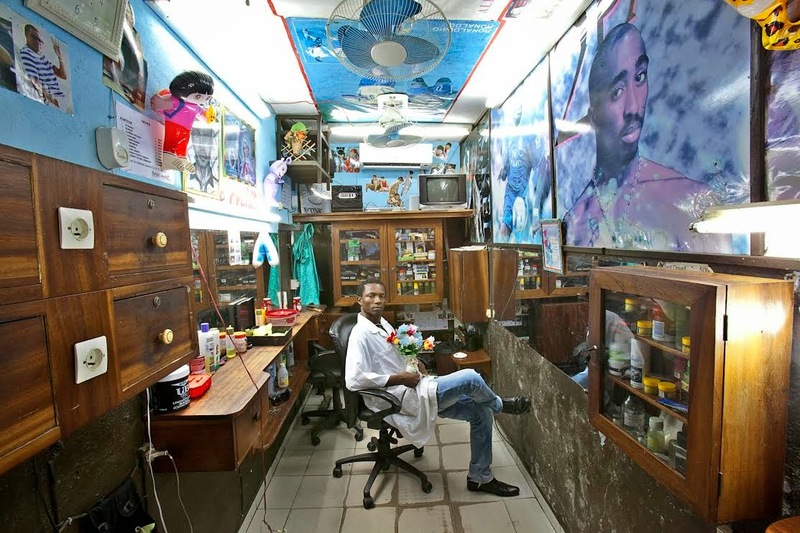 Nigerian photographer Andrew Esiebo presents men’s barbershops from eight African cities, slyly equating the cutting of hair with the making of art and the selection of a hairstyle with the forging of an artistic identity. Esiebo’s lively images are far from typographic, yet the shops’ retro-styling looks decidedly consistent: are there, I asked him, subtle differences between nations? He thought not, seeing evidence of underlying continental unity – along with a pride in hair – rather than as a stage for diversity. One shop is recreated on site, allowing you to walk into the photographs and pose as a customer…though I should warn those due a cut that no barber is actually present. Brooklynite Josh Blackwell is known for sewing onto everyday items: previously at Kate MacGarry handkerchiefs and sweaters. But his plastic bags, ongoing since 2004, are the most convincing: a more extreme contrast between worthlessness and art value; good use of the iron (protected by baking paper) to flatten and merge the bags (they also take laser cutting well); and bags seem naturally of the street – indeed, Blackwell has taken to working on a found a bag and then returning it to its original location for a photograph. You might also be reminded of jellyfish (after which some of them are named), although I tended to see cats. Dean Hughes @ Maria Stenfors, unit 10, 21 Wren St – KX? Talking of male embroiderers (away with those stereotypes!) there’s plenty of intricate sewing in Dean Hughes’ first move into the application of colour. Wooden frames are hung with shapes of calico, crazed by the creases which the dying process causes in such a sensitive material – and which remain visible even after they’ve been ironed (though actually I seem to achieve a related effect with cotton!). 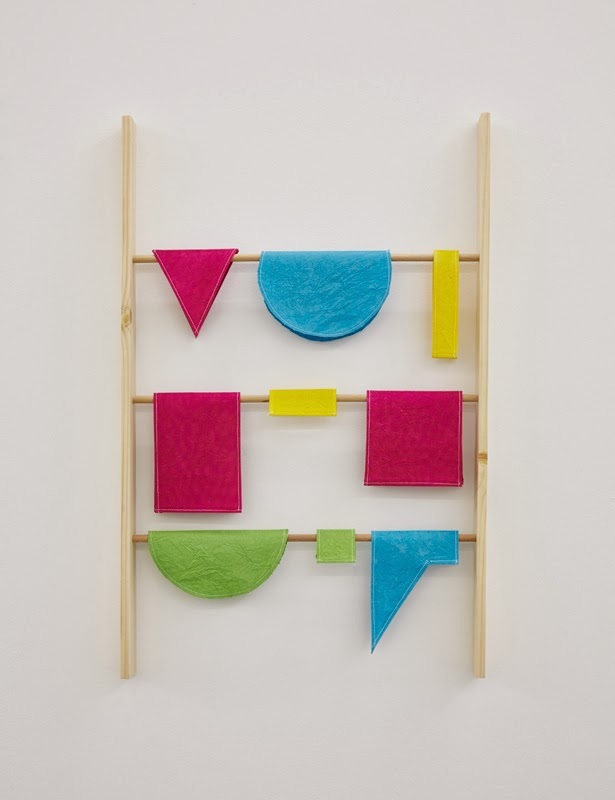 The effect is bunting / clothes dollies / paint samples / anthologies of abstraction with a hint of seriality and a sense of potential exchange – indeed, Hughes says he found himself swapping colours around once the works were in the gallery, though he’s not encouraging visitor revisions! Tel Aviv and Berlin-based Ariel Reichman insists a on cool white minimalist space by refusing to use the walls. But the show has a dark heart: a narrow pitch-black room in the middle – on the outside of which are drawings, photographs and ‘a burnt stone’ – houses Reichman just-about operating a wind-up torch fast enough to be visible on film. 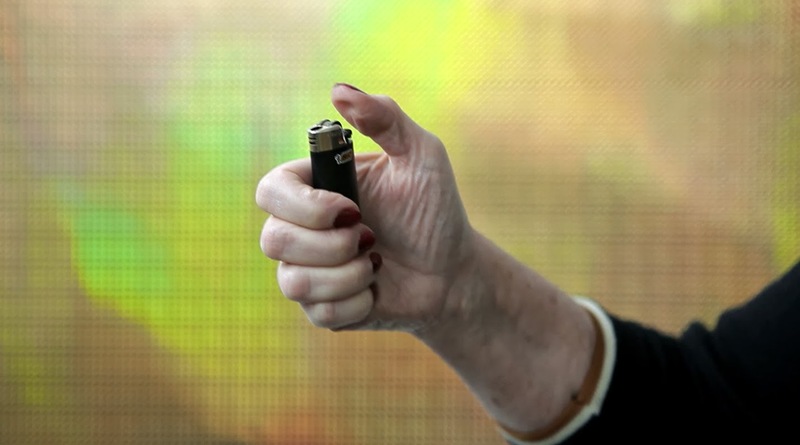 Yet his mother has it tougher, struggling for five minutes to get the knack of igniting a cigarette lighter for the first time. A couple of hundred attempts see her essay such moves as the wrist-hold, the shake and the multi-flick until her thumb’s distinctly dented. Given my DIY skills I empathise. Is it just as hard to find illumination in art? A cat watches a wine glass rotate as it’s spooked by light in Helen Maurer’s Prowler, a work which felt endangered at the private view – though why shouldn’t found objects return to circulation? – Danielle Arnaud’s Kensington redoubt. 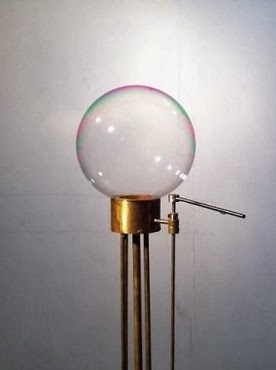 Yet this show, on tour with two extra artists and a text by Peter Suchin, picks up on the alchemy rather than the cat or the glass, notably in William Waterhouse’s beautiful bubble-making machine and Sarah Woodfine’s table of drawn sculptures of the ingredients – bat, chrysalis, root, frog – of a witch’s brew intended to incite the sensation of flight when ingested. The cause, according to Woodfine, would have been the palpitational effects of contrasts, a sense of which we do pick up in the stimulating mixture here.